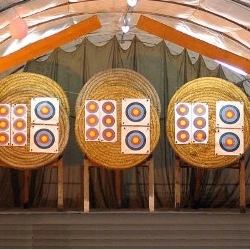 A municipal property, the plant is used specifically to the sport of archery and the management is entrusted to the association "Arcieri del Basso Reno" of Argelato. The outdoor ativities begin in May and end in September, while in the period from October to April is held at the minicipal gym of Argelato. In order to attend the camp, you have to enroll the courses. Info : Mauro Baldassarre - Arcieri del Basso Reno A.S.D. All areas are easily to access. There are changing rooms and services accessible to disabled people.